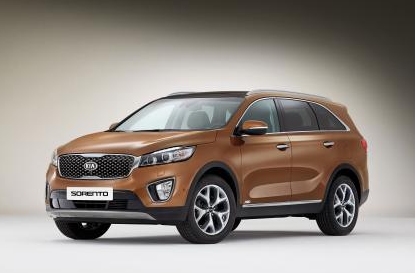 Full details of the new Kia Sorento, set for release in 2015, have been released. The SUV will make its debut at the Paris Motor show in October and is expected to enter the market at £27,000, positioning the Sorento as a direct rival to the Volvo XC90, Ford Edge and Hyundai Sante Fe. The latest incarnation of the Sorento is set to offer drivers cruise control, speed limit recognition and sensors to provide blind spot and front end collision warning. In addition to this, Kia have promised that the Sorento will offer a more refined ride, with reinforced suspension mounts and bodywork which is 14 more rigid. A dashboard increased in thickness by 29% should also help the new Kia reduce noise. Features within the cabin itself are set to include a 360-degree parking monitor, one-lever folding seats in the rear of the cabin and an automatic electric tailgate. In terms of size, the Sorento is set to offer a more spacious cabin, with the length of the car increasing by 95mm. It will also offer a lower ride, 15mm to be exact. The new Sorento will be offered as both a 5 seat and 7 seat model and drivers will be able to choose between 5 engines including a 2.2 litre turbo diesel .